HOSPITALS — once synonymous with a place to go when you’re REALLY sick is now the last place you want to be unless it’s prescheduled surgery with a doctor you trust. If you’re elderly and/or on Medicare you are treated as a money machine — not a person. The first time you go to the ER they will probably let you go home after the inconclusive tests BUT should you go back within 72 hours the hospital will admit you. This is because the insurance companies won’t pay for a second ER visit without a diagnosis and admittance. 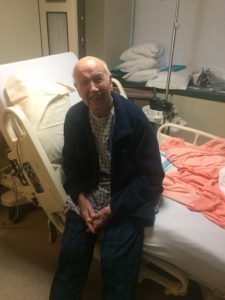 I took my 90+ Dad to his HMO doc. He was having balance issues with other symptoms that portend a stroke. We rush to the ER and sit in highly uncomfortable chairs with all types of sick people. After approximately 2 hours they call Dad into a “room.” The medical techs hook him up to a glucose drip and leave the room. For the next 3 hours he is taken from one machine to another for test after test. Because my Father is elderly he meekly goes where he’s told. At the end of this interminable afternoon we receive an “inconclusive diagnosis” and he is allowed to go home. Two nights later the same symptoms occur — my brother calls 911 and Dad is whisked off to the hospital. I get home in time to follow the ambulance to the same hospital where we’d spent the afternoon. I stay with my Father — they finally move him to an ER room and begin to do THE EXACT SAME TESTS they did 48 hours earlier. I question every one. It is now 1 am in the morning — I find blankets and sleep on the floor next to Dad’s bed because they are going admit him. (Remember, if they don’t admit him the hospital won’t be paid.) In every case, with every test, the results were the same as the ones 48 hours earlier BUT now the diagnosis is not inconclusive . . . it’s we need more tests and observation. After two days they allowed him to leave with the diagnosis of dehydration! Bottom line, if you have an elderly parent or grandparent do not trust the hospital. When either of my parents stay in the hospital overnight we hire a “babysitter”. Yes, it costs money but your loved one doesn’t wake up to an empty room trying to figure out where he or she is. Further, I check the chart constantly to see what is diagnosis and medicine is being used. Truthfully, it’s like having a child — the difference, I’m grateful to be able to reciprocate what was done for me.